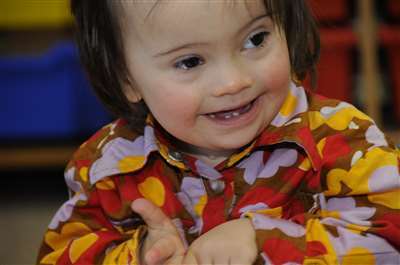 How often are children with Down syndrome twins? The likelihood of having non-identical twins runs in families. Women whose mothers, sisters, or aunts have had twins have an increased chance of having non-identical twins. The risk also increases with mother's age; a woman who gives birth at 37 is four times more likely to have non-identical twins than at age 18. Neither age nor family history seems to affect the incidence of identical twins, which account for about 4 per 1000 births worldwide. These figures only apply to spontaneous, or natural births. Assisted reproduction techniques, particularly ovarian stimulation, increase the risk of twins and multiple births. Twins or multiple births occur at a rate of about 2% in the population of 15,000 babies with Down syndrome recorded on the UK National Down Syndrome Cytogenetic Register. A total of 244 twin pairs are recorded (some prenatally diagnosed), including 29 pairs (11.8%) where both have Down syndrome. Nine sets of triplets are recorded, each with one affected child. In twin pairs where both have Down syndrome they may not be identical (from one egg), as one pair are a boy and a girl. In a small number of cases, the affected pregnancy was assisted using hormones. These figures indicate that, in a group of 1000 babies with Down syndrome, some 14 or 15 babies will be a twin or a triplet, with their other twins/triplets unaffected, and 2 or 4 babies will be identical twin pairs, both with Down syndrome. If we consider all births, we estimate that identical twins with Down syndrome occur at the rate of 1 or 2 in a million pregnancies and non-identical twins at the rate of 14/15 in a million. If the likelihood of having a twin or twins with Down syndrome is also linked to a family history of twins, to age or to assisted pregnancies, we presume these factors will play a part in increasing the risk for some individuals.